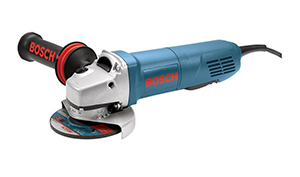 The Bosch 1700A mini grinder, featuring a 7 amp motor and 11,000 rpm no-load speed, includes an AC/DC switch, making it compatible with the DC outlets on welders. 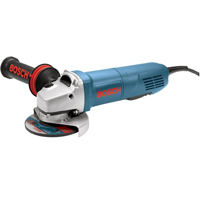 The grinder offers a 5/8-inch-11 spindle for mounting the most popular accessories, and its ball-bearing motor and output delivers smooth performance and long life. Its two-position side handle is angled for comfort, and the user can make quick guard adjustments without tools. The unit’s ServiceMinder brushes take the guesswork out of preventive maintenance. Standard equipment includes guard, side handle, flange kit, spanner wrench, and a metal grinding wheel.